I was asked to design a display in the canteen for my company IMI Truflo Marine and successfully coordinated the project from start to finish. The primary reason for the project was to improve the atmosphere of the staff canteen and boost staff morale. 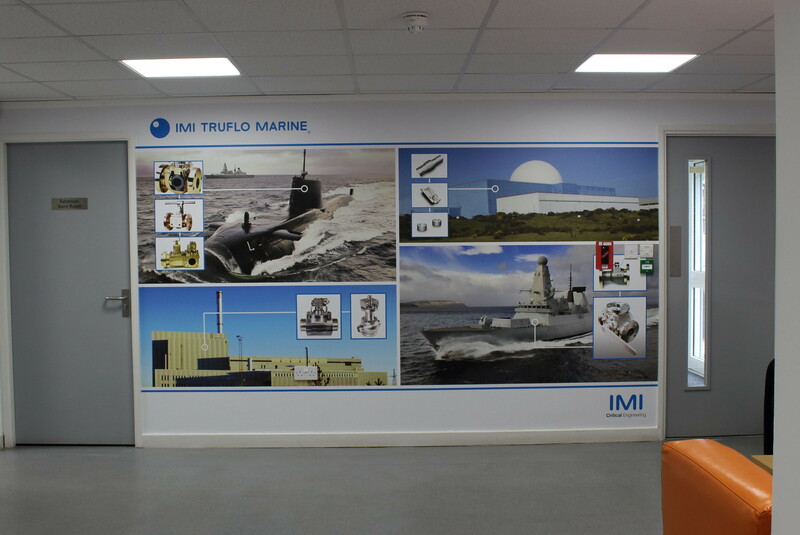 IMI Truflo Marine had previously absorbed IMI Components just over a year previous to the project and the image needed to represent both parts of the organisation. I first looked at the available space, then opted for one wall in particular upon which the display image would have the biggest impact. The project was undertaken with local design agency Typecreative. They assessed the area and recommended a durable type of wallpaper resistant to bumps and scrapes. The paper they recommended is a bit thicker and more durable than regular wallpaper. You can tell it is a quality product as soon as you see it. The extra thickness and lightly dimpled surface is more resistant to damage and less likely to show it over the course of its lifetime. The design process involved me working closely with Typecreative to come up with a rough layout and source the images. I had to think of a way to represent all parts of the business and the varied products we produce. In the end, the concept I went for is one that shows respect to all sides of our business. Having just one image would not fully convey the variety of products we produce and their multitude of applications. Our core competency is the production of high integrity ball valves, but our capabilities have lead to us working in two very distinct markets; Marine Defence and Civil Nuclear. For that reason, I decided to go with a split design in four quarters to represent all corners of our business. Because it was going to be displayed in the canteen, I wanted to show staff both the end product and the small part that they were contributing to the whole, to help remind them how critical their work is. I believe that it can be discouraging to think that the process you undertake is meaningless. But in the worlds we operate, the smallest job is of the utmost importance because the failure of the smallest part can result in the loss of a submarine or a catastrophic nuclear event. With a rough concept and a few images to work with, Typecreative advised on their suitability and refined the design. One of the biggest challenges was to source images that were of a high enough resolution to look good on a large wall. I must say that I really appreciate the assistance the UK Ministry of Defence offered in providing an image database of their ships and submarines for PR purposes. I made sure I included the submarine Astute, which is probably the most visually exciting end product of the hull valves that we produce. The fourth quarter is a Type 45 warship. Accompanying the marine images were several of the valves we supply for that market. To represent nuclear power valves and components, I included Sweden’s Forsmark and Britain’s Sizewell power stations along with ball valves and components we have supplied and continue to supply to power stations. The idea of showing the parts supplied wasn’t to be 100% accurate in terms of where the specific parts were supplied, but to give a general representation of what we do. From the concept and images I provided, Typecreative brought it all together, breathing life into the design. I was really happy with the end result. I had just returned from the B2B Marketing Expo at the ExCel arena in London and it was a great feeling to see something I’d been working on come to life. Completing projects really fills me with pride and is one of the reasons I enjoy my job; to see the results of my hard work. https://twitter.com/TheodoreBigby/status/731020795120656385After a challenging design process, the end result has taken pride of place in our canteen.